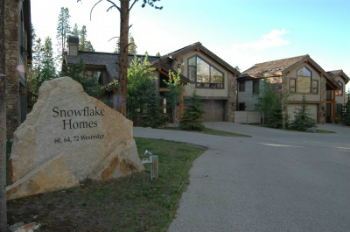 Any Snowflake homes for sale in the subdivision will have the front-lawn look of a family neighborhood, a mountain family one, but nonetheless one on a paved street, with a paved driveway, and on smaller than some of the more rural Breckenridge area neighborhoods. But out the back, it’s a ski slope in the winter and preserved wetlands along Sawmill Creek in the summer. The views from Snowflake feature Mount Baldy, Boreas, Red and others along the Continental Divide as it make a curve around Summit County. Read more about the history of this popular neighborhood, or check out the available Snowflake homes for sale below! This neighborhood was carefully designed in the late 1990’s to be a single-family enclave that would fit in with the other development around the base of the Snowflake Lift, and allow for the building of the skiway that peels off Four O’clock Run and lead to the base of the gondola. The Skyway Skiway is now complete, and kept snow-packed in the winter so it is possible to ski from this area all the way to town, and the gondola. A short drive to connects Snowy Ridge to the Breckenridge Historic District with shops, restaurants and the Riverwalk performing arts center. Ski out the backdoor – or hike and bike in the summer. 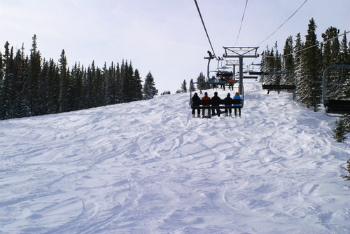 The ski area is on national forest, so the backyards of Snowflake homes that are slopes in the winter are trails in the summer that connect to other trails in the national forest. Breckenridge Resort also runs an Alpine Slide, a zip-line-like coaster and several concessions for families during peak summer months. Size: 3602 sq. ft. to 5185 sq. 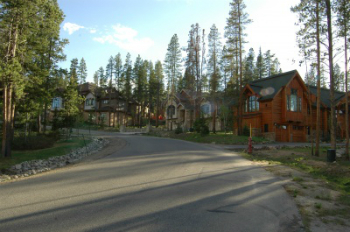 ft.
From the center of Breckenridge (main stop light on Ski Hill Road) drive south on Park Avenue to Four O’clock Road. Continue on this road to Snowflake Dr and turn left. Take the first right onto Westridge Road, and the Snowflake homes will be on the right. Does the Snowflake subdivision sound idyllc to you? Contact Breckenridge Associates to get a tour of the neighborhood!